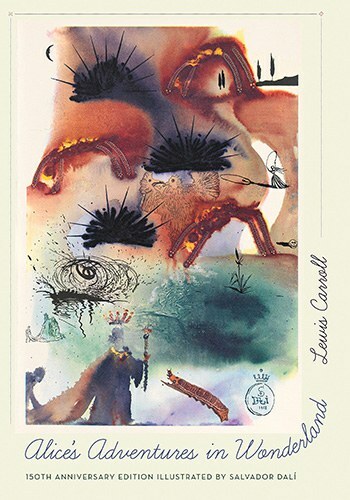 This edition is valuable because it underscores a variety of connections that are generally not foregrounded in the work of either Lewis Carroll or Salvador Dalí. I blew a bunch of student loan money on a trip to Paris my first year of graduate school. My mother spoke excellent French and I spoke none, and the trip was her only bucket list item, so there you have it. On my punchlist of stuff to do in Paris was a bunch of things my mother didn’t care about, like visiting Jim Morrison’s grave and going to the Dalí museum in Montmartre. This was 15 years ago, and despite the comparatively huge size of its permanent collection, Espace Dalí is still fairly obscure because it focuses on sculpture and engravings. This was a pilgrimage to see his illustrations of Alice in Wonderland, which I only knew of because Random House had commissioned these 13 works of art for a limited edition of 2,700 copies in 1969. If you look for one now, the cost of it dwarfs what I spent on the Paris trip. The Alice in Wonderland book itself turns 150 this year and it has no end of diverse, deeply invested devotees. So the new anniversary edition from Princeton University Press is not at all about the merits of the story. It reproduces the 1987 MacMillian version of the text “generally considered by Carrollians (and by Carroll himself) to be the most authentic and correct,” as Mark Burstein, president emeritus of the Lewis Carroll Society of North America tells us in his introduction. The other opening commentary is courtesy of Thomas Banchoff, professor emeritus of mathematics at Brown University, and both their remarks make clear that the focus of this edition is Dalí’s contribution. Burstein first makes the case as to why Carroll and Dalí are on the same page. There are several reasons. Perhaps most obviously, the surrealists considered Carroll one of their own. For his keen perception of the merits of madness, his many invented word collages, his exotic juxtapositioning of unusual animal characters, and even the fact that he first told the Alice in Wonderland stories while engaged in the automatic movement of rowing a boat, surrealists from Max Ernst to Marcel Duchamp were eager to engage the text as source material for their own works of art. Secondly, it’s a little known fact that Dalí spent the entire winter of 1945 at Walt Disney Studios working on an animated film about the nature of time that would have likely turned out to be some kind of bizarre cousin of the Fantasia film, had it not been lost. Destino was ultimately re-created from the 17 seconds of film that remained alongside Dalí’s original work on the project, and was released on 2003. John Hench, who worked at Disney for 65 years, did the story for Destino with Dalí. He was also an artist on Fantasia and the art supervisor on Alice in Wonderland, which was in production at the time of his collaboration with Dalí. So Dalí had his eye on Alice in Wonderland as a subject of interest for more than 20 years before he worked on these illustrations. And finally, there’s the mathematics angle. Carroll’s work as a mathematician is common knowledge, but somehow Dalí’s obsession with and thorough knowledge of mathematics is often overlooked. This involves a tricky conversation about the fourth dimension and abstract things like that, so Burstein simply cuts off his introduction by saying, “Professor Banchoff will now elaborate further.” Banchoff is there basically to vouch for Dalí’s math field cred based on his firsthand collaborations with Dalí that began in the mid-'70s. They talked about process holograms and especially bonded over a cardboard model of an unfolded hypercube that the artist incorporated into Crucifixion (Corpus Hypercubus). They bonded over geometry and logic in the classical work of fellow Catalonian Ramon Llull, and Banchoff watched Dalí use binoculars to work on the Abraham Lincoln portrait within Gala Contemplating the Mediterranean Sea. So this edition is valuable because it underscores a variety of connections that are generally not foregrounded in the work of either Carroll or Dalí. Dalí’s 13 images are easily viewable all over the Internet now, but seeing them right up next to the chapters for which they were intended does do them a more proper justice. Engaging the text side by side with the artwork yields a myriad of interesting tonal effects in both the words and the pictures. It’s an entirely different approach to the notion of illustration, as Dalí’s emphasis was on the attitude and emotional landscape of the story rather than its plot. There is such a looseness and flexibility in the images as a reader attempts to bring them to bear upon the Alice in Wonderland storyline, that it produces a completely distinct vibe from the original drawings. The 12 chapter illustrations are rendered in full color on the third page of each chapter, so a reader will begin to sink into the next adventure, then is startled by whatever weird tropes Dalí’s work has latched onto, and finally the rest of the chapter is inflected with that somewhat darker and more bizarre haze of interpretation. It allows Alice in Wonderland to be read as surrealists have long been reading it, and makes explicit connection to the conventions of their genre that might sometimes otherwise elude more traditional readers of this book. The 13th image is not a chapter illustration. It’s a reproduction of the signed engraving included in the original limited edition, where Dalí is sitting in the foreground contemplating the mighty red Alice as she casts a long shadow over the straight and narrow road before her, a single flower up front and a single bird in the sky. There are mountains on the horizon. This is the most obvious choice for a cover image because it belongs to no chapter in particular and emphasizes the artist’s long, large contemplation of Alice. Because it’s only three colors, I suspect Princeton didn’t find it stunning enough to use for the cover. A diehard Dalí fan would love it, but it’s not quite a sample of his trademark style and not quite bold-looking enough to catch an uninvested reader’s eye in the bookstore. Instead, the cover went to Chapter Ten’s The Lobster’s Quadrille. This story features the Mock Turtle and the Gryphon, but is one of the most obscure sections of the book. However, Dalí’s work of art contains many of his most recognizable themes, is wildly colorful, and of course also alludes to the Lobster Telephone, an object of which even most people with shallow knowledge of Dalí’s work are aware. So this, in keeping with the brevity and clarity of the introductory material, points toward the fact that the book is targeted to be very accessible to mainstream readership. Perhaps this is not enough to satisfy serious Dalí lovers, but for the vast majority of interested parties who can’t afford to spring for the insanely priced limited edition, or a trip to Paris to view the originals, this book is unquestionably as good as it gets. What a relief to finally have it available, with the 150th anniversary as a very nice excuse. Of course, that anniversary belongs to the original illustrator, Sir John Tenniel. Dalí’s works of art are approaching their 50th anniversary in a few more years, and there remains plenty of room for a deeper and more comprehensive treatment of his Alice in Wonderland vision at that time. Meanwhile, this book succeeds in scratching the itch many admirers of Carroll and Dalí have felt for too long.